Why not samba into Rio during its famous New Year's Carnival, and enjoy the rhythm of this colorful city from the lofty balcony of your Penthouse Suite? If life is a carnival, then Rio's Belmond Copacabana Palace is the perfect place to live life to its fullest, in an unselfconscious playground known for sunbathing, samba music, and seeing or being seen. Kings, princes, presidents, and rock stars have been escaping to this Mediterranean-style icon of sophistication and suavity since 1923, lured by the hotel's glamour, elegance, and legendary service. Its central location, sandwiched into a world-famous setting, allows the Copa to cool its façade in the breezes off the white-sand beach that carries its name, while turning its equally sumptuous back to Sugarloaf Mountain and Rio's imposing statue of Christ the Redeemer. With a history that spans decades of jet-setting shenanigans—including Orson Welles' mischief during a stay in 1942, not to mention visits by Janis Joplin and Mick Jagger in the '70s—the Belmond Copacabana Palace remains a class-act hotel that embraces its roots in the local Latin culture. Its 225 rooms and suites have fine period furnishings and stylish marble baths and open onto views of the sea or bustling Avenida Atlantica. 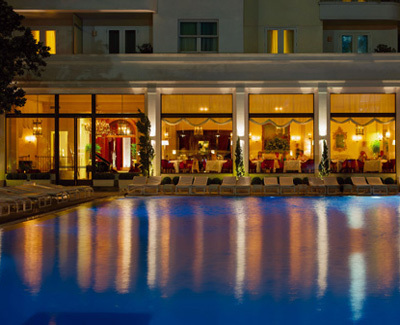 The elegant Hotel Cipriani restaurant and the al fresco Pergula Restaurant offer complementary fine-dining options. And beyond the glittering chandeliers of the Copa's public salons and piano bar lies the pulsating city of Rio, sophisticated, exciting, and waiting to be discovered.